Areas of Vvardenfell controlled by House Redoran (red areas). House Redoran is one of the five remaining Great Houses of the Dunmer. 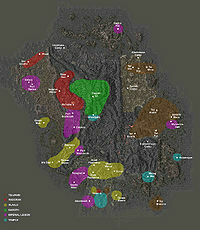 It governs the Redoran District of northwestern Morrowind from the city of Blacklight, close to the border with Skyrim. In the District of Vvardenfell, the House's council seat was located in Ald'ruhn, and all councilors lived there in the hollowed shell of a colossal prehistoric Emperor Crab, in the district known as Ald'ruhn-under-Skar. Other Redoran-dominated towns on Vvardenfell included Khuul, Maar Gan and Ald Velothi. The main focus of House Redoran is maintaining the traditions of the settled Dunmer and, more specifically, the way of the warrior. Due to this focus, the Tribunal Temple was a natural ally. There is also mutual respect between them and the Fighters Guild and Imperial Legion. They have less respect for the other Imperial institutions, such as the Mages Guild, the Thieves Guild, and the Imperial Cult religion. 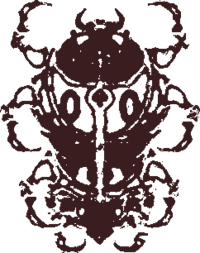 They appropriated the ancient Dwemer symbol for Lorkhan as the sigil of their house. A Redoran's duty is first to the Tribunal Temple, second to the Great House Redoran, and third to one's family and clan. A Redoran noble must know the virtue of gravity. It is not the Redoran way to laugh at serious matters, for it shows disrespect. It is not the Redoran way to spread rumors, for they fester and breed dissention [sic]. Redoran settlements are designed in the Dunmer village style, built of local materials, with organic curves and undecorated exteriors inspired by the landscape and by the shells of giant native insects. Redoran villages are typically centered on Temple compounds and their courtyards, with huts and tradehouses gathered around a central plaza, as in the West Gash village of Gnisis, which was, for a time, rented to the Imperial Legions. Conflicts often arise with the other Great Houses. The most obvious conflict during the late Third Era was centered on the town of Caldera that was founded by the Imperial Caldera Mining Company with the support of House Hlaalu. There was also bickering with the Telvanni concerning the founding of certain new settlements in the Ashlands. House Redoran's leader as of the late Third Era, Bolvyn Venim, was somewhat unscrupulous for a Redoran. Few among the rest of the hierarchy actually liked him, but the Redoran respect for strong leadership (which few Redoran leaders have displayed in recent history to that point, hence the weakness of the house during the time) and prowess in arms ensures that he nevertheless retained his position. He was influential in securing Redoran's share of the frontier lands when Vvardenfell was opened for settlement in 3E 414, and moved the council to Ald'ruhn as a result. During the Oblivion Crisis, the Empire pulled a vast majority of the Legions out of Morrowind to deal with the gates opening in their homeland of Cyrodiil. The Dunmer had no standing army at the time, and the armies of daedra destroyed the Redoran city of Ald'ruhn. The destruction of their ancestral city, coupled with their historic status as "the hereditary defenders of the Morrowind", led to House Redoran taking charge, and they were slowly able to raise an army. After the Oblivion Crisis, the house started to rebuild. However, in 4E 5, the Red Year brought further destruction to Morrowind. All of the settlements on Vvardenfell were obliterated. The Redoran councilor living in Mournhold at the time coordinated the relief effort, issuing a directive to send soldiers, supplies and able-bodied mer to the settlements which were hit the hardest. Shortly after the eruption of Red Mountain, Morrowind came under siege from the Argonians of Black Marsh. While the Argonians were able to decimate the south and east of mainland Morrowind, the army of House Redoran prevented them from progressing further into the north and west. The political affairs surrounding the Oblivion Crisis and the Red Year culminated in a power vacuum, as House Hlaalu was unceremoniously dismissed from the Grand Council. Animosity between Hlaalu and Redoran increased, as House Redoran seized the opportunity and became the leading power in what remained of Morrowind, taking the position that Hlaalu had held for centuries due to their close ties with the Empire. The Hlaalu believe that Redoran were directly involved in the reorganization of the council, and have held a grudge against them ever since. Subsequently, Redoran relocated the capital of Morrowind to Blacklight, as Mournhold had been sacked by the Argonians. In 4E 16, the High King of Skyrim gave the island of Solstheim to Morrowind as a refuge, and it passed into the control of House Redoran (though the Telvanni established their own settlement, Tel Mithryn, on the southeast coast). House Redoran benefited from the mining of ebony there until 4E 181, when the mine at Raven Rock was closed. House Redoran's neglect of Solstheim increased, as without the mine, the island not only held little economic or strategic importance compared with the other seventy-three outlying settlements of Morrowind, but was a significant source of casualties for the Redoran Guard (they lost twenty-six guards in a two-year span). However, in 4E 201, the mine reopened, and House Redoran took a renewed interest. Redoran Cooking Secrets — How to cook "Crab Meat and Scuttle" and "The Hound and Rat"
This page was last modified on 24 February 2019, at 05:05.